Made from quality cotton canvas and smooth finishing wooden poles, the teepee tent is strong and.. This large sized Teepee which stands 160 cm x 160 cm x 200 cm is suitable for both indoor and ou.. 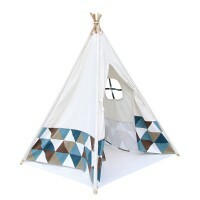 This Medium sized Teepee which stands 120 cm x 120 cm x 140 cm is suitable for both indoor and o..